Miniature roses are true roses, bred to stay small in size. Most mini roses also have smaller flowers than standard rose bushes, but they come in a variety of types and colors. Despite their small size, miniature roses are extremely hardy. In fact, they are more winter hardy than most tea roses. Miniatures also tend to be profuse repeat bloomers. The genetic parentage of miniature roses can be difficult to define since they have been in cultivation since the 17th century, but most originated as genetic mutations of Old Garden Roses (Rosa gallica and Rosa centifolia), or China roses (Rosa chinensis). Most types now grown are the result of extensive breeding and are quite divorced from the original native species. All miniature roses work well in a border or as edging. However, they are especially nice as specimen plants in containers, where they can be brought closer to eye level and truly be seen and appreciated. Native Area: None; miniature roses are a cultivated creation with no native range. Plant and treat miniature roses the same way you would full-size roses. Dig a hole the same depth as the pot the rose came in and about a foot wider. Carefully remove the rose from the pot and gently loosen the roots. If the plant is tightly root bound, use a sharp knife to score the sides of the root ball and try again to loosen the roots. Add some organic matter to the soil to the hole, if your soil needs it. Place the rose bush in the center of the hole, with the roots spread out. Fill in the hole and gently firm down the soil. Thoroughly water the newly planted bush and then apply a layer of mulch. Most minis are not budded or grafted, so gardeners in colder climates don’t need to worry about covering or mulching the graft, and gardeners in warmer climates won’t need to be concerned about suckers from the rootstock. Miniature roses thrive in full sun. Foliage and flowers will become sparse in shady conditions. Roses like a rich, well-drained, loamy soil. This is one plant where potted specimens can be grown in commercial garden soil rather than a potting soil mixture. Do not dig garden soil from the garden to use in your pots; instead, buy bags of garden soil. How much water your rose bush will require depends on your soil and weather. A general rule of thumb is to provide at least 1 inch of water each week. During hot, dry spells you will need to water more frequently. Be sure to water deeply, so that the soil is wet at least 12 to 18 inches below the surface. Avoid getting the leaves wet during humid weather to discourage fungal diseases. Although mini roses do quite well in containers and you often see them sold as houseplants, many gardeners are disappointed by their performance indoors. Like roses, they need full sun and medium humidity. These are easy enough to provide in summer, but humidity drops considerably when the heat comes on indoors and roses will quickly become desiccated. Mini roses given as gifts will do best if transplanted outdoors. Feed when the bush first leafs-out. Feed after each heavy flush of bloom. Stop feeding about 6 to 8 weeks before the first expected frost to discourage new growth that could be killed back during winter. Climbers: Minis roses with a vertical, rambling growth habit can be trained to grow against supports. The only thing "miniature" about these roses is the size of their flowers. Award-winning 'Jeanne Lajoie' doesn’t appear to be a mini at all, when allowed to reach heights of more than 7 feet. 'Snowfall' is a white ever bloomer with canes that stretch out 7 to 12 feet. Trailers: Miniature roses with a cascading growth habit can be are wonderful in baskets and over walls. 'Sequoia Gold' has double flower fragrant yellow blossoms that repeat all season. 'Green Ice' is a hardy plant with unusual blooms that start out as apricot buds, open to double white flowers and age to a cool light green. Micro-mini: These are the smallest miniature roses. They grow only 6 to 12 inches tall, with proportional tiny blossoms of 1/4 to 1 inch in size. 'Bambino' has 3/4 inch vibrant orange blossoms on an 8- to 12-inch plant. 'Chasin' Rainbows' has yellow flowers that are edged in scarlet on a 10- to 15-inch bush. Miniflora: This is an American Rose Society classification for newly developed mini roses that have a slightly larger plant and bloom size than miniature roses. Average plant size is 2 1/2 to 4 1/2 feet tall. As with other roses, prune miniature roses just before new growth starts in late winter or early spring. Hard pruning is not necessary. Prune dead or broken wood first. Then trim back about a third of the plant to maintain its shape and encourage new growth. Unfortunately, mini roses are subject to the same problems as larger roses, including black spot, a fungal disease. Powdery mildew can also be a problem. Improving air circulation can help keep fungal problems to a minimum. 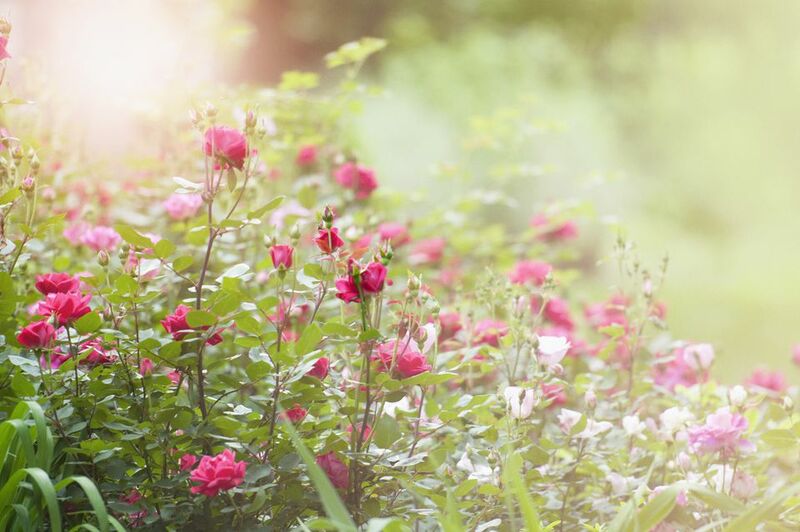 As with other roses, systemic rose-care products can help prevent diseases and discourage pests. Keep an eye out for early signs of insect damage (Japanese beetle, thrips, mites, or chafers) and treat accordingly. Is It Possible to Regrow Cut Roses?